I found this expensive eyelet material at a local sewing store and knew I had to have it. 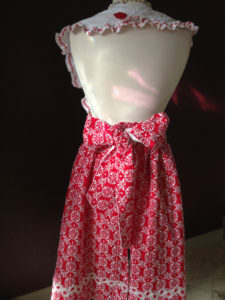 I realized after I made this apron, it reminded me of my Southern Roots and how sometimes when creating and hosting an event, I could look oh so beautiful and southern in this apron. 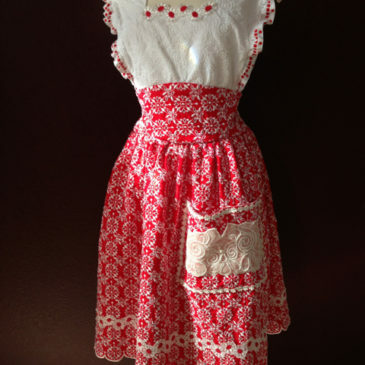 Skirt is lined with white lace material (same as bib), Embellished with lace, ribbon, buttons to give it a retro feel. 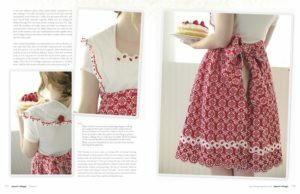 Both my SWEET DAISY DOTS AND THE MOTHER OF ALL APRONS, are used in various advertisements for Stampington Press Magazines. 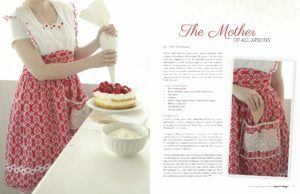 Featured in Apron.ology 2014, Page 120-123, and won 3rd Place at San Diego Fair 2014. 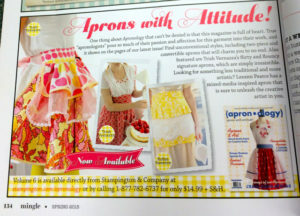 Both My Sweet Daisy Dots and Mother Apron are used to advertise Apronology magazine in various Stampington Magazines. Available on Etsy!! !